The Alta Peak Chapter of the California Native Plant Society (CNPS) is offering two special Spring field trips for children, inspired by the wonderful, new CNPS curriculum, “Opening the World Through Nature Journaling”, created by John Muir Laws and Emily Bruenig. Each child will be given a “nature sketch journal” and a pencil to document the nature walk, creating a map of their own discoveries as they hike, with thumbnail sketches to capture quick notes. They will construct a map of treasures found along a trail as we walk and stop and look. Unlike other activities that are done in one spot, the treasure map is made along the trail while hiking and stopping in several places. The group will move slowly along the trail, looking for interesting nature discoveries that the kids can map as they go, with quick sketches and inventing place names along the way. These field trips are designed to encourage children to notice nature up close, and drawing skills are not emphasized at all. The curriculum was developed by Jack Laws, who was the enthusiastically received Alta Peak Chapter program speaker at the Green Faire in October of 2009, in collaboration with Emily Breunig, an English and writing instructor. Any local artist, botanist or plant lover who would like to volunteer with the children for these outings can contact Elsah Cort. More treasure mapping field trips may be planned for the summer at higher elevations in Sequoia National Park, and in the Autumn for observing nature in other seasons. 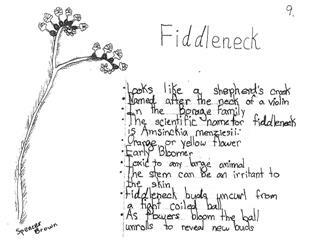 This interdisciplinary combination of art, science, writing, and observation exempliﬁes the California Native Plant Society’s goals in creating educational programs: to engage students of all ages in the incredible natural world of California, to inspire them to keen observations of the wild places in their own backyards, and to foster in them a desire to protect these unique habitats. Reservations are required for these field trips, so the Chapter can make sure each child receives a nature journal. The age limit for these field trips are from 7-12 years. Adults are welcome to come with their child. It is suggested that each child bring a hat, a knapsack, drinking water, and snacks or a sack lunch. Each child will receive an artist’s sketch journal, pencil and eraser. They should wear long pants, or jeans, and good walking shoes. Optional items could include a small magnifying glass, their favorite pencils and a portable pencil sharpener. The group leader will have some magnifying glasses and pencil sharpeners to loan. Also, make sure that the kids have a bathroom break before the meeting time of 10 am. Meet at the end of Skyline Drive in Three Rivers, at the gate to the BLM property. Park on the side of the road, being careful not to block private driveways or the right of way for traffic. Please carpool if you can. Call Elsah Cort at 559-561-4671 to reserve a space and field journal for your child. Each field trip will be limited to 15 children, so sign up early. More educational resources can be found on the CNPS website at http://cnps.org/cnps/education/resources.php.